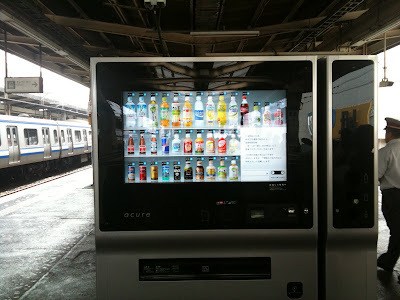 Now several months ago I was surprised to see the regular vending machine on the train platform at Funabashi station replaced with what looked like a large flatscreen TV. The screen of course displayed the drinks usually sold and since I have an iPhone I knew what to do. It is almost like I was trained for the moment. But it still felt like something out of a sci-fi movie. When I was a kid I used to think about touching the screen and getting what I wanted out of the TV. For example the TV commercial on was showing an ad for a toy or candy and I thought wouldn`t it be cool if that just popped out of the TV and in my hand or I could just reach in and grab it. Well, this is starting to get pretty close to that. Of course this sort of technology can`t be found in the comfort of the average home but it is the next step in the blending of the digital and real world. We interact with the digital world and receive a physical need almost instantaneously. I purchased this Lipovitan D energy drink using my suica digital currency card which is heavily used in Japan. Click here for more SUICA. I discovered that it is rather difficult to film and pull out my wallet which is over stuffed with receipts and point cards. I`m such a sucker! If you can picture this on a bigger scale you could even imagine department stores in the future that would scan your body and impose clothing on a digital screen for you to see yourself and perhaps you could purchase clothes from around the world. It could happen before we know it! Even 10 years ago I would never have dreamt of buying a cold drink from a TV screen. While I doubt that this vending machines actually pays for itself I find it a fascinating display of technology and a window into the future. As a side note, perhaps this works in Japan because of the low crime rate, I`m sure this thing would have to be guarded heavily if offered to the public in many other nations around the world. That is really cool- I hope these come to the States! Ha! you know i am going to have to throw the mark of the beast and the image of the beast into this comment somehow! This convenience is going to lead to something else. Why would someone invest so much into this technology? This too has actually been in Japan at various public locations for almost 3 years now. Touch screen intercoms and other forms of touch panel technology I saw about 5 years ago in Japan for the first time. Many of us have been familiar with vending machines But don’t know about supplier. Supplier role is most important in service of Vending Machine. Touch screen vending machine is ultimate and wonderful technology.It is very attractive.Thanks for sharing.